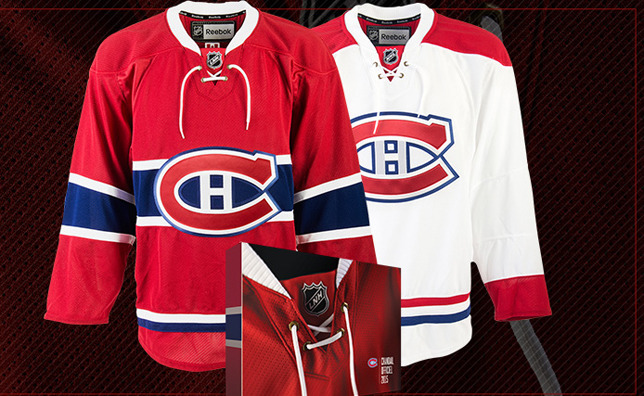 MONTREAL – The Montreal Canadiens unveiled Friday their new jersey design for the 2015-16 season. The jersey debuted on stage at the 2015 NHL Entry Draft held in Sunrise, FL, when it was presented to the team’s first-round selection, Everett Silvertips defenseman Noah Juulsen. The changes to the jersey are the first since 2007 and the most extensive made to the iconic sweater in more than 40 years. The team’s new jersey will be similar to that first worn by the Canadiens from 1941 to 1945 and then from 1946 through 1974 – a period in which the club laid claim to 13 Stanley Cup Championships – with several notable differences. Four brass hexagonal eyelets and white laces will be reintroduced around the collar, which will also revert to pure white in color. On the team’s red home jersey, the French “LNH” logo will be stitched at the nape of the neck, an homage to the roots of the franchise and the lone exception to the “NHL” visible on all other jerseys across the League. The new Canadiens jersey is available for pre-order now via retailer Tricolore Sports, online at tricoloresports.com and at the main store located at the Bell Centre. Jerseys ordered by August 31 will be delivered in a custom box with several bonus pieces by the team’s first preseason game on September 22.